How to turn a horse into a horsedog in one easy step. Next, allow the kid to look at the new picture and watch the mass confusion as he/she tries to figure out how the nice moving horsey has become a static horse dog. NB: Please note that some 5 year olds may cry as they just cannot seem to figure out what happened to the horsey. If this happens, tell him/her to shut up and grow up. 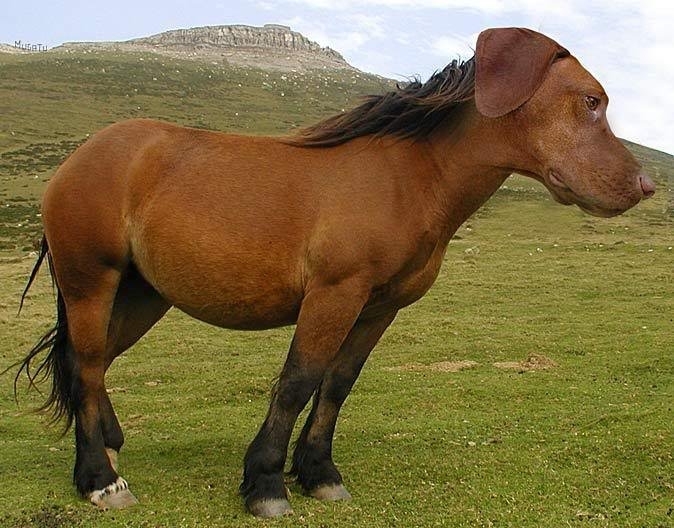 12 Responses to How to turn a horse into a horsedog in one easy step. Everyone be down on this. I dig it. Can it morph politicians and celebrities? Please put Trumps head on something. How do you think Trumpys’ hair turned out the way it did? I agree with Mark that this is disturbing! I don’t think I want to play fetch with this animal. I’m wondering what a small child did to you way back when . . .
Well if they had of bought me a pony, none of this would have happened! You’re a sicko and I have a real appreciation for that. They don’t cal me Bill Y “Sicko” Ledden for nothing and thank you. It’s like antibiotics. Far too much antibiotics are prescribed and the body becomes used to them and then they become useless. No imaginary son of mine is going to grow up full of antibiotics! For some reason, I find that incredibly disturbing. Your work is done, here.